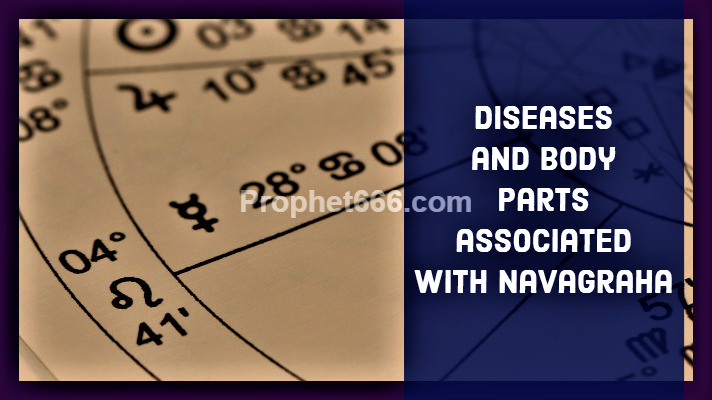 In this post, is given a description of the diseases associated with the Navagraha or the nine main planets and the parts of the human body, which are ruled by these nine planets as per traditional Hindu Astrology. 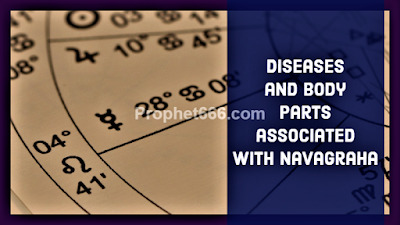 Medical Astrology has always associated certain body parts and diseases and ailments with the Navagraha and practitioners of medical astrology prescribe astrological remedies or Totke and Upay based upon the position of these planets in a horoscope to cure or give relief to the sufferer. In Western Astrology, this study and treatment of diseases and ailments based upon the position of planets in a horoscope is called as iatromathematics and it is also an ancient system of healing by using astrological remedies. Given below are brief descriptions of the diseases and body parts associated with each of the Navgraha. Surya or Sun – heart diseases and ailments, fever, poor vision and diseases related to eyes, skin diseases, ailments related to the teeth and gums and Neuralgia or a condition related to pain originating from the nerves. Body Parts Governed – head, heart, the left eye of a woman and the right eye of a man, bones and spinal cord. Chandra or Moon – Insomnia and Sleep related disorders, mental disorders and hallucinations, diseases of the lungs, like pleurisy, digestive disorders and gas problems, skin diseases, impurities of the blood ans excess retention of water. Mangal or Mars – bilious disorders and ailments related to the bile, excessive heat in the body, diseases related to the bones and bone-marrow, small pox and ulcers. Body Parts Governed- the chest, head, bone marrow, the left ear, the uterus, pelvis, external reproductive organs, the prostrate gland and the muscular system. Budh or Mercury – problems related to the mind and mental diseases, skin diseases, anemia and liver diseases. Body Parts Governed- the nervous system, hips, skin and lungs. Guru or Jupiter- Liver disorders, diseases and ailments related to the ears, appendicitis and phlegmatic personality related disorders and abnormal growth of cysts. Body Parts Governed- blood circulation and the quantity of fat in the body, the brain, thighs, stomach and the liver. Shukra of Venus – diseases related to the urinary tract and genito urinary problems, disorders in the ovaries and reproductive system, anemia, liver problems, problems related to the bile, skin disorders and eye infections. Body Parts Governed- eyes, reproductive system and seminal fluids, kidneys, throat, chin and cheeks. Shani or Saturn – stomach disorders, paralysis, rheumatism, cerebral ailments, deformity of the bones and other body parts, problems related to the knees, gall stones and dental diseases. Body Parts Governed-the muscular and nervous system, bones and bone formation, teeth and hair, ears. Rahu or Dragon Head and Ketu or Dragon Tail – leprosy, poisoning causes by toxic substances, dropsy, hysteria and mental imbalance, epilepsy, cancer, leucodermia and sufferings due to epidemics. Body Parts Governed-this depends upon the house in which they are placed and their association with other planets. Note- All kinds of astrological remedies can be seen in the sections on Hindu Astrological Remedies, Tone and Totke from the Lal Kitab, Astrology Mantras and Yantra in Astrology. Mangal for the left ear. Which planet governs the right ear?